The Areca Palm Tree, also known as golden cane palm, cane palm, yellow butterfly palm, bamboo palm and Madagascar palm. It is a common landscape plant. It has multiple stems that grow 20 to 35 feet tall at a rate of 2 feet or more per growing season. For best results, plant Areca palm in areas where average low temperatures range between 35 to 40 degrees Fahrenheit. It grows in U.S. Department of Agriculture plant hardiness zones 10 through 11 and does well indoors or outdoor in containers. Sun, Soil and Sea: You can plant the Areca palm tree in clay, loamy or sandy soil with an acidic to alkaline pH. This versatile tree does well in sites with full sun to partial shade, with access to plenty of water. An Areca palm planted in full sun tends to turn yellowish-green, but retains its green color in partial shade. It is moderately tolerant of salt spray from the ocean. Trunk, Foliage, Flowers and Fruit: The Arcea palm is known for its attractive trunk. The leaf scars on the 2- to 3-inch diameter trunks of the Areca palm are tightly packed and have a wide range of colors, including yellow, orange and shades of green. The large leaves grow 6 to 8 feet long and provide a low to moderately low amount of shade. Drooping, yellow flower stalks grow below the leaves and produce insignificant white flowers that beget 1-inch-long, egg-shaped fruit that starts out yellow and turns purple to black. 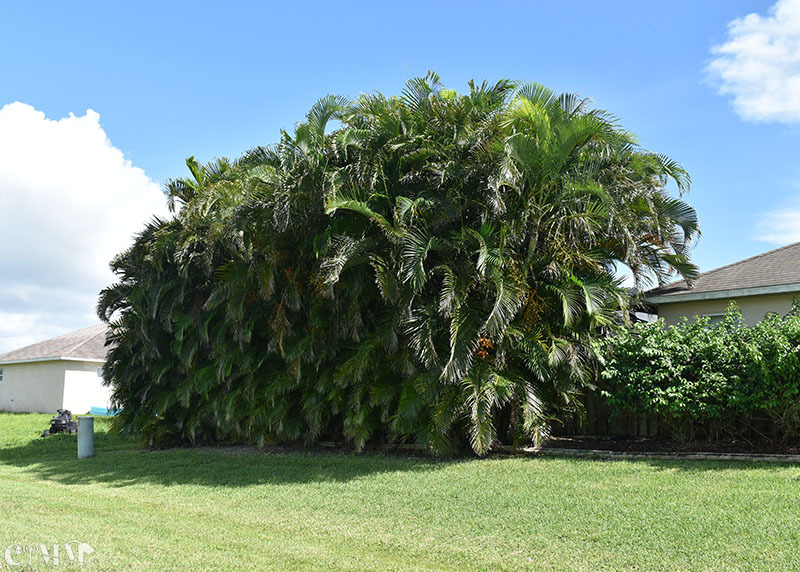 In the Landscape: Areca palm trees make an ideal natural fence when planted in clusters about 10 feet apart. Once the trees fill out, this natural fence doubles as a privacy screen. They also make an attractive stand-alone specimen. For the most attractive look and a healthy tree, prune the lower leaves to reveal its mulch colored trunk and to prevent insect infestations and fungal growth.